THE ICON RECOGNIZES A SINGULAR WOMAN FOR HER OUTSTANDING CONTRIBUTIONS. THIS YEAR, THE LA DESIGN FESTIVAL IS AWARDING THE ICON TO TWO TIME OSCAR-NOMINATED COSTUME DESIGNER RUTH E. CARTER FOR HER INCREDIBLE WORK ON OVER 40 FILMS. FROM HISTORICAL EPICS LIKE AMISTAD TO CREATING THE SEMINAL AFROFUTURIST AESTHETIC FOR BLACK PANTHER, RUTH’S WORK SPANS DECADES, WORLDS, STYLES, AND HISTORY. THIS IS THE FIRST TIME THAT A COSTUME DESIGNER HAS BEEN RECOGNIZED BY THE LA DESIGN FESTIVAL. That ability to narrow in on the small yet significant details that convey the nuances of a character, layering meaning through the visual language of clothing, is what has made Carter’s work an essential component of the success of the films she’s worked on. From her early collaborations with Spike Lee on such seminal films as School Daze, Do The Right Thing and Jungle Fever to her work on historical dramas including Lee’s Malcolm X, What’s Love Got To Do With It, Selma, and The Butler to her latest work, the ground and box office breaking Black Panther, her designs impart a depth and emotional resonance that, while it may not be immediately apparent to the novice filmgoer, adds up to a emotionally satisfying experience. Costume design by Ruth E. Carter for the film series Roots. Photo courtesy of Ruth E. Carter. "A costume designer is a storyteller and as a storyteller we have to have a lot of layers and a lot of reasons why we choose the things that we choose to put on the actors,"
Carter says, explaining her work. Though Carter’s process seems simple and straight-forward enough — she starts with the script, letting the images and colors wash over her — her complex thought process, years of experience and and meticulous research takes her work to another level. “I start combining colors. I start looking at color palettes. I look through magazines. I look through books. I look online and I try to put together a color story.” To illustrate her approach, she shares a story about the evolution of her work on Erik Killmonger, the compelling, angry and yet vulnerable antagonist in Black Panther played by Michael B. Jordan, from her initial thoughts on reading the screenplay through her conversation with director Ryan Coogler and her shopping trip with Jordan. As described in the script, Killmonger was an anthropologist in a bespoke suit. “I was like, okay, so he’s in disguise...I guess.” Following the script’s lead, “we pulled a whole bunch of suits for him: three piece suits, Gucci, we spared no expense. But it just didn’t feel right.” She shared her confusion with Coogler. “Ryan’s thought was, ‘Let’s just make him a real guy. Unapologetic. An urban guy who repre-sents the lost tribe who spares no words and we just make him radical.” Putting the finishing touches on the designs would hinge on Jordan’s perspective on the role. Trusting her instinct she arranged a shopping trip with Jordan that would enable actor and costume designer to communicate visually. “There’s a store in Sunset Plaza that I really love and it’s very avant-garde and very urban.” Her controlled gamble paid off. “I pulled the clothes that I wanted him to try on. We actually found the sweater [a floor length black cardigan that Killmonger wears on his arrival in Wakanda] and we found drop crotch pants [which he wears during the museum heist]. Michael loved the store so much he was walking in and out of the dressing room, choosing clothes and putting them on right there.” The result of this collaboration between actor, director and costume designer is a powerful performance supported by clothing that conveys the character’s many layers — brash, angry, intelligent, rebellious, wealthy and sophisticated. Costume design by Ruth E. Carter for the film Black Panther. Photo courtesy of Ruth E. Carter. 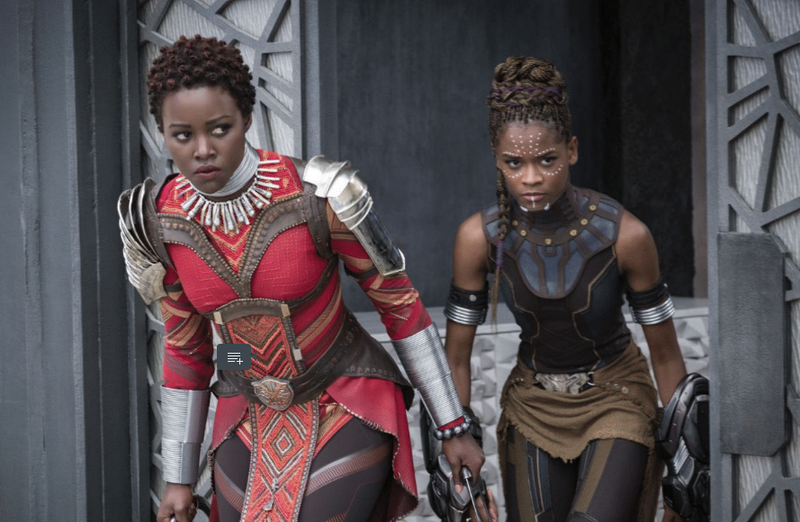 Carter brought this level of depth to each of Black Panther’s characters — there’s the vibrant red she chose for the Dora Milaje that makes even a small gathering of the warrior women feel like an army; the changeable greens that Nakia, the Wakanda spy, wears that act as a mood ring for her emotions, her environment and the chameleon-like nature of her work; the royal garb of Angela Basset’s Queen Ramonda, which fuses African-inspired shapes (her flared hat is a riff on a Zulu headpiece) with modern technology (parts of the look were 3D printed). When you consider that there are hundreds of characters, from the over two dozen lead and supporting roles to the extras, it’s no wonder that, post-production, Carter retreats to the quiet of painting. (An exhibition of her work will be traveling the country, starting in Pittsburgh, through Chicago and New York before settling at FIDEM in Los Angeles in 2019). Carter credits Romare Bearden as her muse. Though the African-American artist is mainly known for his collage work, he wasn’t bound by an allegiance to any media. He drew cartoons, painted in oils, authored books and wrote songs. In a similar fashion, although Carter’s respect for history, tradition and culture — whether real, as in Malcolm X or Selma or imagined, as in Black Panther — is clear, she has learned how to work these elements into a unique language all her own. In the case of Black Panther, Carter found her influences across a vast spectrum that included Afropunk elements (African culture fused to future ideas), African ceremonial dress, Marvel’s vision, Coogler’s take, and the language of the comics. As Bearden once said, “the artist with vision sees his material, chooses, changes, and by integrating what he has learned with his own experiences, finally molds something distinctly personal.” Filtered through Carter’s vision, the effect is at once dazzling, timeless and certainly iconic. For that reason, the Los Angeles Design Festival is bestowing on her this year’s ICON award.